Blood samples can be submitted for any of the genetic tests. Have your veterinarian draw 0.5-1 mL of blood into an EDTA blood tube (also known as “purple-top tubes”). The blood must not clot. If shipped within 1-2 days after collection, blood does not need to be refrigerated, but should not be exposed to direct heat or direct sunlight. Clearly label the tube with the date, animal’s name and the owner’s last name. Put into a zip-top bag to ensure that there will be no leakage, and include the Sample Submission and Order Form and Client Information form in the package when shipping. Blood samples should be received within 2-3 days after collection. Samples may be returned via regular mail (international customers please use airmail). To avoid DNA contamination, keep the animal being tested separate from other animals and do not feed them for at least 2 hours prior to sampling. It is recommended that pups not be swabbed until they are weaned. 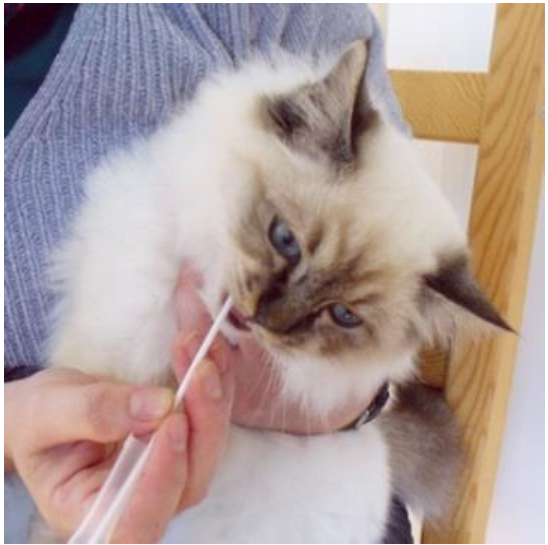 Not all cats will allow swabs to be collected; if you are unsure if you will have enough cells, err on the side of caution and send a blood sample instead. 1. Open the swab envelope far enough to grasp the handle and remove the swab, without touching the swabbing surface. 2. 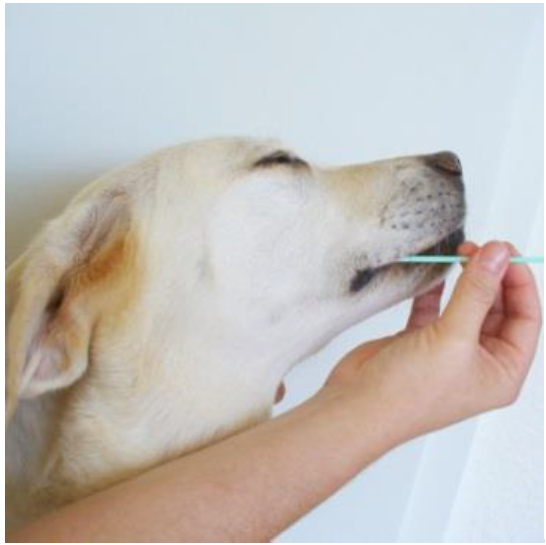 Place the swab between the cheek and gum of the animal being tested. 3. Rub the swab firmly against the inside surface of the cheek for at least 20 seconds to collect cheek cells (not saliva). 4. Allow the swab to dry for approximately 2 minutes, then place it back in the original package and repeat with the second swab. 5. Tape the end of the swab package to secure the swabs (a sticker is included in the collection package for your convenience). 6. Samples do not require refrigeration and can be returned via regular mail (international customers please use airmail). DNA can be isolated from the follicle attached to the end of hair that has been plucked. Pull 30 – 40 hairs from the mane and/or tail of the horse, making sure that there is a follicle (root) attached to the end of each. Hair must be pulled and not cut. The hair may be taped to a labeled piece of paper (with the tape NOT touching the follicle) and inserted into a zip-top bag or envelope. Only one sample should be in each bag or envelope to avoid contamination, but all samples can be send to us in one major envelope. The paper should be labeled with the date sampled, the CAG Animal ID and CAG Client ID if known, or the names of the animal and owner. 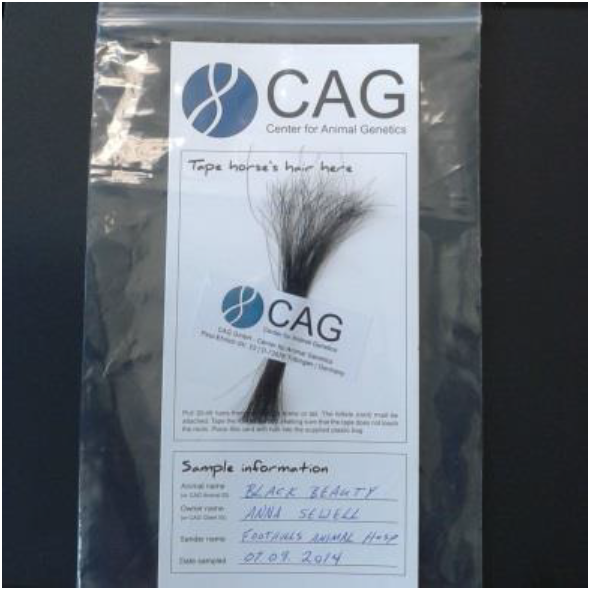 CAG also has free Hair Collection kits available to order if required. Samples do not require refrigeration and can be returned via regular mail (international customers please use airmail). 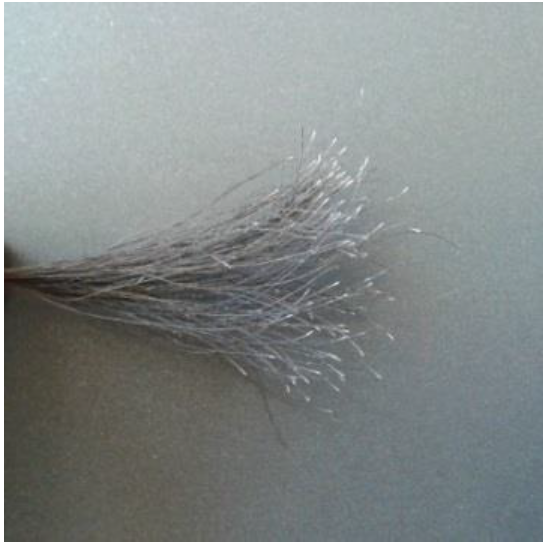 Example of plucked horse hair; the roots are white spots at the ends of the hair. Hair taped to collection form, inside zip-top bag for shipping. Sample Collection Kits can be requested free of charge here.